Ships today if you order in the next 14 hours 27 minutes. 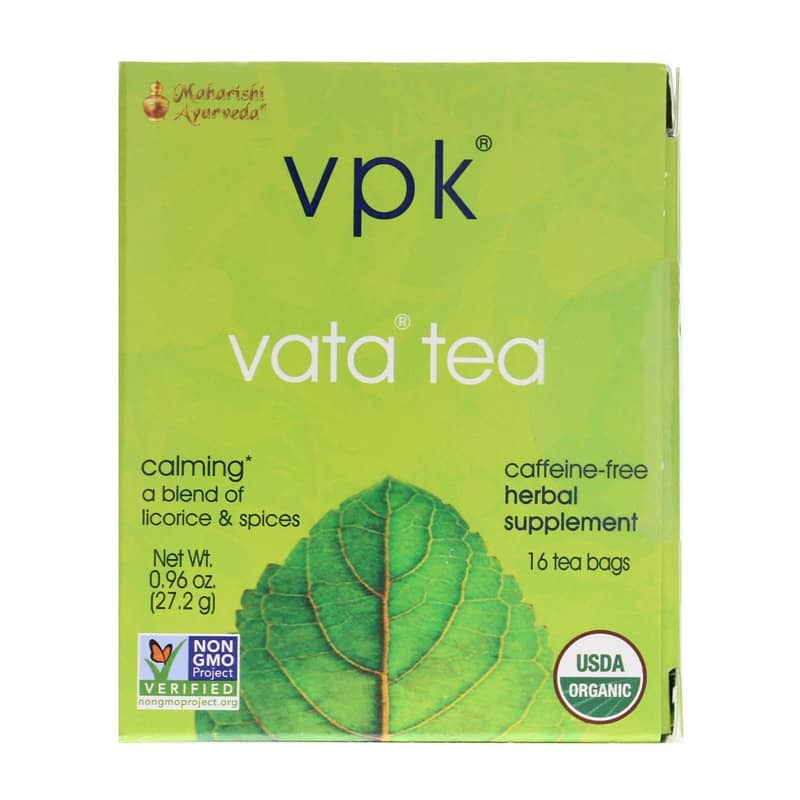 Vata Tea Calming from vpk Maharishi Ayurveda offers a soothing blend of organic ingredients that work to calm the mind and promote relaxation. Vata is considered the leader of the three Ayurvedic principles in the body. It is thought to govern the balance of movement, breathing, elimination, blood flow, and the thoughts. 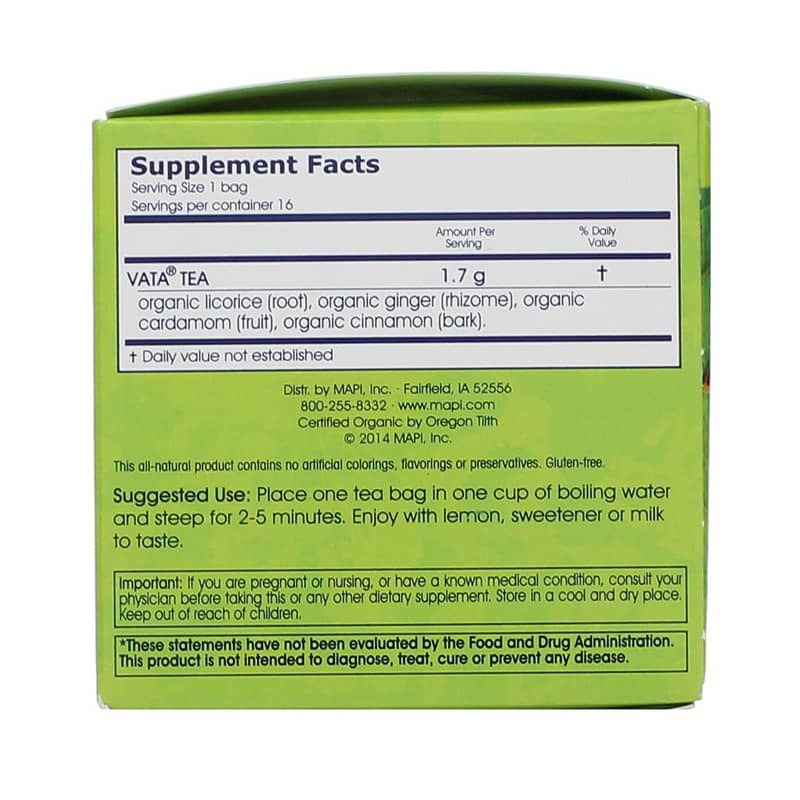 Because Ayurveda is designed to support balance in the body, this tea was also designed to support Vata balance. This tea contains licorice, ginger, cinnamon, and cardamom to support your health. Cardamon works to support digestive health and promotes overall gastrointestinal system health. Similarly, ginger works to soothe the stomach and promotes digestive system health. Licorice and cinnamon work to support a healthy internal response, and cinnamon offers antioxidant support to protect cells from damaging free radicals. This tea has a sweet, pleasant taste and is caffeine-free. 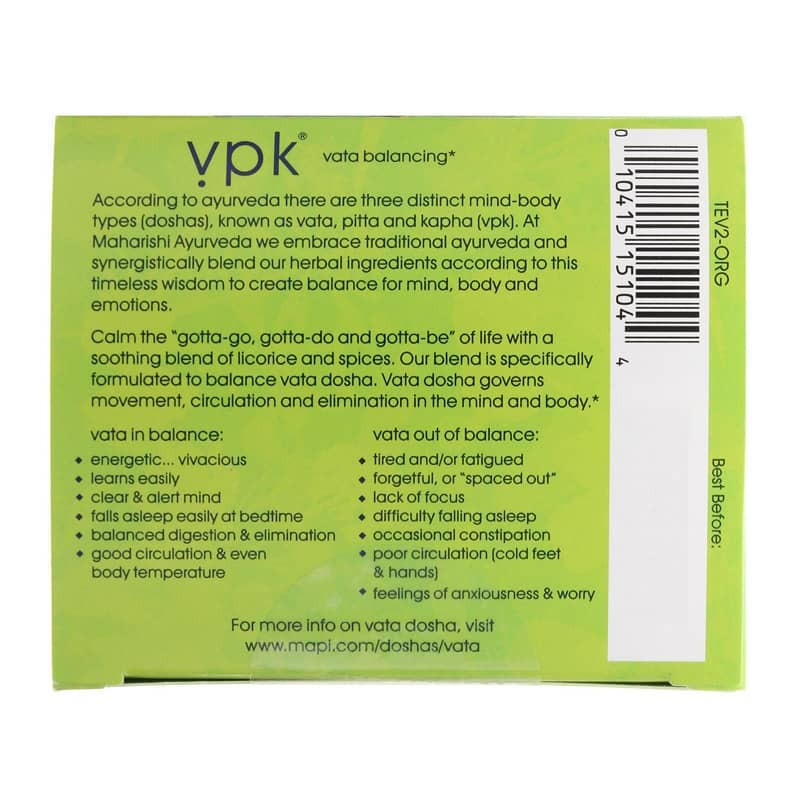 If you’re looking for a calming tea to support relaxation and promote a calm mood, choose a balancing blend like Vata Tea Calming from vpk Maharishi Ayurveda. ---organic licorice (root), organic ginger (rhizome), organic cardamom (fruit), organic cinnamon (bark). Adults: Place one tea bag in one cup of boiling water and steep for 2-5 minutes. Enjoy with lemon, sweetener or milk to taste. If you are pregnant or nursing, or have a known medical condition, consult your physician before taking this or any other dietary supplement. Store in a cool and dry place. Keep out of reach of children. Vata Tea does exactly what it's name implies - it calms!<br>The world we live in today requires calming influences to keep us centered and able to enjoy our lives. purchased for a friend. she loves it.